RCPal Affiliate Program | Earn Cash Doin' What You Love! JOIN RCPal AND START EARNING STORE CREDIT TODAY! 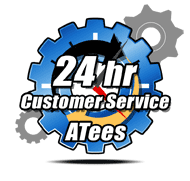 ATees' RCPal Affiliate Program allows you to earn commission when you bring in a sale on our site from anywhere outside of ATees.com. We provide an effective way to monetize the work that many of you already do - share product information and contents online. RCPal is a program for you to make money, while doing what you love. Our affiliate program is open to everyone. How do I become an RCPal affiliate? Anyone can join and there are no restrictions to become an affiliate. To join the affiliate program, sign up or login to your account and click on the JOIN NOW button at the RCPal Affiliate Program section. After your RCPal account is approved, you will be assigned a dedicated affiliate id code. This code can be embedded into any links on atees.com and be posted or sent to any websites, groups or individuals. Once a person clicks on your link, everything they purchase on ATees Hobbies for the next 10 days will be credited to you. There are many ways you can share links, e.g. sharing links on social media channels, blogs, forums, etc. How does the link click/purchase get tracked back to me? You will be assigned an affiliate code. When you share links, add the code to the link. Our website will track this code whenever a user clicks on the link. You can track clicks, payouts, claims in your account. How is my commission calculated? The entire order will be counted towards your commission. For example, if you promote a blog content, when the person clicks on the blog link and makes a purchase within 10 days, you will receive commission from all the products ordered. Let's look at another example. If you promote product ABC, and the person clicks on your link (that directs them to product ABC), and does not order product ABC but five other items, you will receive commission from all those five items. Affiliates are entitled to earn commission multiple times if multiple orders are made within 10 days of the active cookie. When can I claim my commission? Commission can be claimed after 45 calendar days from the date of purchase and the total RCPal balance reaches at least $30 USD. What pages can I share on ATees.com to earn commission? You can share any pages on our site. Add your own affiliate code to the end of the links you would like to share. The affiliate code is used to track clicks back to your account. Can the affiliate code be pasted on any page? For example, even blogs? Yes, it can be pasted anywhere. You can share affiliate links on blogs, social media comments, websites, etc. As long as the link can access our website, the affiliate tracking will work. The only page you cannot past the affiliate code is on our homepage (https://www.asiatees.com). Clickable links work the best. Can I embed my code in search result pages? Does the shopping cart have to be empty before someone clicks on my RCPal links? No, you will be credited with the sale as long as customers click on your affiliate link at any given point within 10 days before they checkout. How do I embed my affiliate code? You may embed the affiliate code like adding another HTML variable to the link. How does it show up on my account? Please note that this program is subject to change at the discretion of ATees as necessary. We may discontinue or make changes in the information or services without prior notice and without liability to our affiliate partners. Membership in the RCPal program is conditional on the basis that where disputes arise, neither ATees or its staff are held liable for any loss or damage including without limitation, direct or consequential loss or damage, arising out of or in connection with the use of the affiliate program. Terms & Conditions of RCPal Affiliate Program is available in the member homepage. No distribution or solicitation is made to us by any person to use this website or the information, products or services contained herein where the provision of this website and such information, products or services are prohibited by law.